Please allow up to 3 business days for order processing. The expected delivery date is provided by the carrier automatically based on origin, destination, and drop-off time (IE: 1 to 3 days for USPS Priority). Since the expected delivery date does not come from Damage Industries, we can not control exactly when it is delivered and does not come with a money-back guarantee. Once a tracking label has been created, you will automatically be emailed with tracking information. 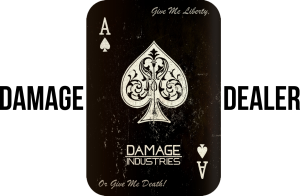 How do I contact Damage Industries customer service? What types of payment does Damage Industries support? Shipping is automatically carrier-calculated based on product weight and shipping destination. Are taxes or fees applied to my order? Indiana residents are subject to 7% sales tax. Where can I sign up for product emails?